Samyang announced the new XP 50mm F1.2 lens for Canon EF mount. It is manual focus , featuring a 9-blade aperture, from 8 groups of 11 lens elements, including one aspherical and one high-refractive lens element . February 20th, 2018, Seoul, South Korea – Global optics brand, Samyang Optics is pleased to unveil the Premium Photo Lens – XP 50mm F1.2 for Canon full frame DSLR cameras. The XP 50mm F1.2 is the third lens of the premium line up, XP series, created under the motto of ‘Excellence in Performance’. 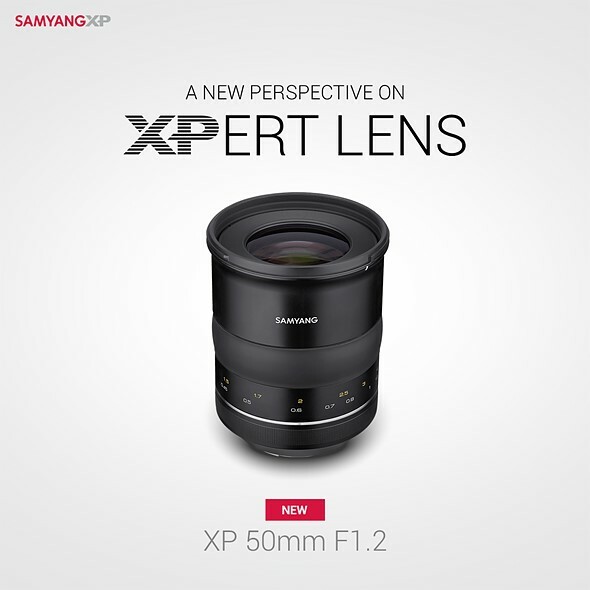 The XP 50mm F1.2 lens is expected to expand the brand power of Samyang in the premium lens market thanks to its great image quality, following in the footsteps of XP 85mm f/1.2 lens and XP 14mm f/2.4 lens . Produced from a total of 11 lenses in 8 groups, you can minimize distortion and various aberrations while producing crystal clear resolution. The special optic lenses, aspherical lens, and high-refractive lens deliver sharp and vivid images to camera sensors by effectively tuning the light path. Also, flare and ghost effects can be well controlled thanks to the ultra multi coating. This entry was posted in Samyang lens and tagged Samyang lens on February 21, 2018 by admin.